"Waves roll in and crash over rock and shore as the mid-day light creates the bluest blue you've ever seen." Artist comment: "I've painted the sea with oil paint hundreds of times in many moods. Here the ocean is relatively calm in summer colors. There is a misty quality that subdues harsh edges, giving the scene a tranquil look. I used a 'reverse C' composition to offset the linear aspect of the water. I painted blues first, then the browns, ending with the translucent wave, white rolling splash, then the foam patterns and runoff on the rocks." "Sunlit Sea" is a 24" X 24" oil painting on stretched canvas. 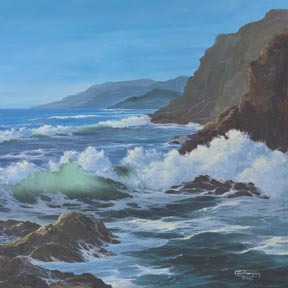 "Sunlit Sea" is a limited edition, giclée print from an original oil painting by Carol Thompson. The edition includes 3600 authorized, signed, limited edition prints (3500 numbered and 100 artist proofs). Release date is April 2012. Image size and substrates vary. All prints are signed and numbered by the artist and include a certificate of authenticity. Paper prints are shrink wrapped on foam board. Canvas prints are coated with a protective spray.